A once lost magnificent antique vase from China’s 13th Century Song Dynasty reappears from the depths of the Mediterranean Sea where it comes to dwell on a piano in a doctor’s home. It becomes the impetus in steering the lives of this doctor and his descendants through their heartbreaks, romances and ultimately successes. An assassination, a sabotage on a Greek island and amazing musical performances are but some of the events that strike their lives. Spanning from 13th Century China to the present, the story takes place on four continents, with talented individuals of different nationalities and backgrounds, always interrelated by music. 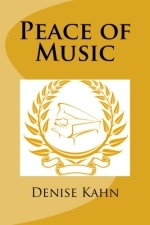 Peace of Music is not just a novel, but a fictionalized memoir. I started writing Peace of Music as an anthology for my son, but very soon it became a novel (much more fun that way) as I could take a few liberties, such as the scenes in China’s 13th century Song (what else?) Dynasty. One of my favorite scenes from Peace of Music. I’m so glad they made a terrific movie about this war’s ‘Silent Night’. The Athinaïko Odeon, the Athenian Conservatory in the old section of Athens, the Plaka, where Maria Callas studied. Valentina and Melina Malandros, two of the main protagonists studied there as well. An aria (Madame Butterfly) and a Greek folk song are sung by Valentina and her entourage in a shelter in Athens during WWII bombings. Festivities with syrtaki and bouzouki to celebrate the liberation!